So today we were to drive from Arches over to Salt Lake City, for a quick pit stop on our way into Idaho for the night. 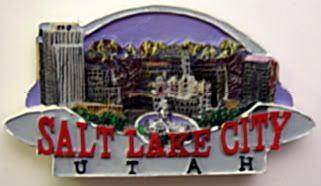 As usual, I had a million things on the docket for this town - main street, Mormon Tabernacle, etc., etc. I've never been to SLC, but I was so planning on doing the most comprehensive drive-by, ever. That's one of my specialties - drive-by tours...I mean, it was a few years before I actually stopped the car to see the Liberty Bell - and even then, it was only because they moved it from that glass-encased building you could see from the roadside, into its own facility. Look. It sounds Clark Griswoldy, but sometimes, that's all you have time for. One thing I was looking forward to visiting on this day (and definitely will at some point) is the Golden Spike National Historic Site - Promontory Summit - where the Central Pacific and Union Pacific Railroads met, making the transcontinental railroad dream a reality. I mean, dudes! They re-enact the final spike being driven into the ground! How freakin' awesome! What? We've already discussed my love of trains.